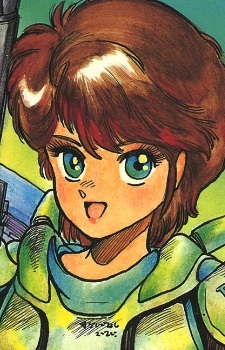 Leona Ozaki is the central character of Masamune Shirow's Dominion: Tank Police anime and manga series. She is approximately 23 years old, stands 5 ft 6 in, weighs 117 lb, has type B blood, has the astrological sign Leo, and, in the first series she sports flaming red hair with blue eyes. In the sequel series New Dominion she is shown with more auburn colored hair and light brown eyes. She is also a Japanese Buddhist who still lives with her parents and obnoxious younger brother.